The Milwaukee County Zoo kind of stood on tradition last year. 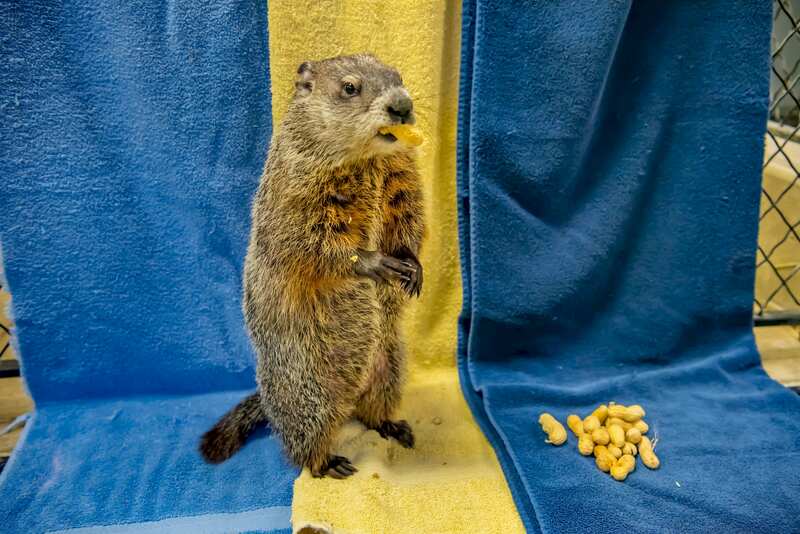 The zoo wasn’t able to get a new woodchuck before Feb. 2, 2018, after its previous groundhog, Wynter (not a typo, its parents were hipsters), died at the ripe old age of 9 in 2017. So, Snow Lilly — a 550-pound polar bear — filled in on Groundhog Day. Snow Lilly did see her shadow and unfortunately for humans (but perhaps good for the arctic mammal) predicted six more weeks of winter. But in May, the zoo received the one-month-old Gordy, a hand-raised groundhog from a USDA-approved breeder in Indiana. He met his first zoo visitors in September during an Animal Encounter talk. It’s a weird holiday. Blame Pennsylvania. Getting a new groundhog — and not having to rely on non-groundhogs year after year — was always the zoo’s goal after Wynter passed away, says Public Relations Coordinator Jennifer Diliberti-Shea. The zoo knows that pacifying the fears of “diehard traditionalists for Groundhog Day” was important, after being put off by last year’s stand-in, according to Diliberti-Shea. Photo courtesy of the Milwaukee County Zoo. This year’s Groundhog Day celebration (which falls on a Saturday) coincides with one of the Milwaukee County Zoo’s Family Free Days, where everyone gets free admission to the zoo — the $12 parking charge is still in place. A “pretty quick” ceremony will be held at 10:30 a.m. in the Northwestern Mutual Family Farm, just south of the zoo’s main entrance, during which Gordy will be invited out of his burrow and then do the … shadow thing. • Groundhogs and woodchucks are the same creature, and they’re part of the squirrel family. • According to StormFax.com, Punxsutawney Phil’s weather-prediction accuracy is about 39 percent, making him an OK weatherman — human-predicted 10-day forecasts are right only about half the time. • During the summer, groundhogs are known to eat as much as one-pound of veggies in a single meal. • In 1886, a Punxsutawney Spirit newspaper editor Clymer Freas wrote: “Today is groundhog day and up to the time of going to press the beast has not seen its shadow.” In true false-advertising style, the original Punxsutawney Phil was called “Punxsutawney Phil, Seer of Seers, Sage of Sages, Prognosticator of Prognosticators, and Weather Prophet Extraordinary” by the paper.